A perfectly balanced East Anglian gem from Powters! It’s been a while since we had the opportunity to try something from Powters of Newmarket and this new East Anglian innovation didn’t disappoint. Powters have succeeded where so many others have tried, and failed. They have combined two great East Anglian flavours. 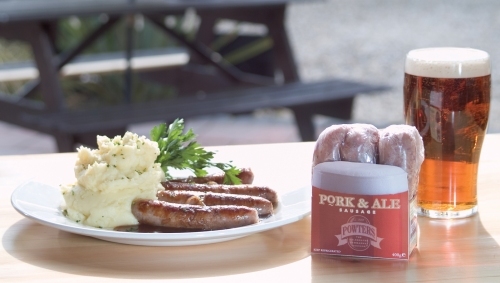 On one hand a fine English sausage, made to a traditional recipe in Newmarket, the home of the Sausage in East Anglia. On the other hand Abbot Ale, brewed at Greene King down the road in Bury St Edmunds. Another “must try” from Powters: Newmarket sausage, available by mail order or at some supermarkets in East Anglia. Perfect for any meal.